Tonight’s games against the Penguins was fast, physical, and aggressive, bringing back memories of the intense playoff series that these two teams played last season. Photo courtesy of MSG Photos. The Rangers (7-6-2) responded to Sunday’s loss in a big way, shutting out one of the best teams in the NHL by a final score of 5-0, handing the Penguins (10-3-2) their first loss in eight games. Henrik Lundqvist was sensational again, earning his 53rd career shutout and his third this season with 33 saves against arguably the best offense in the entire league. Henrik stoned numerous Pens throughout the night, including another fantastic save, this time on Chris Kunitz. Lundqvist earned his seventh win of the season tonight. All five goals came from five different Rangers, which is always great to see from any team. New York also managed to score on the power play, the first time that has happened against the Penguins in the last 11 games. As Rick Nash said, the defensive aspect of the game was excellent, with all of the goals coming from good defense and off of the forecheck. The Rangers shut down the entire team, but most notably, Sidney Crosby. Crosby had a minus-two rating and was held to just one shot on goal, a big reason that the Rangers had success. The Rangers came out extremely aggressive and fast, drawing an early penalty and throwing five shots at Fleury in the first few minutes, but he made all of the stops. Perhaps the biggest moment of the first period was not one of the goals, but instead it was an excellent defensive play by Tanner Glass, who mimicked Matt Hunwick from earlier this season by stopping a puck that trickled through the pads of Lundqvist right on the goal line. This play was a lot more important than it seems. 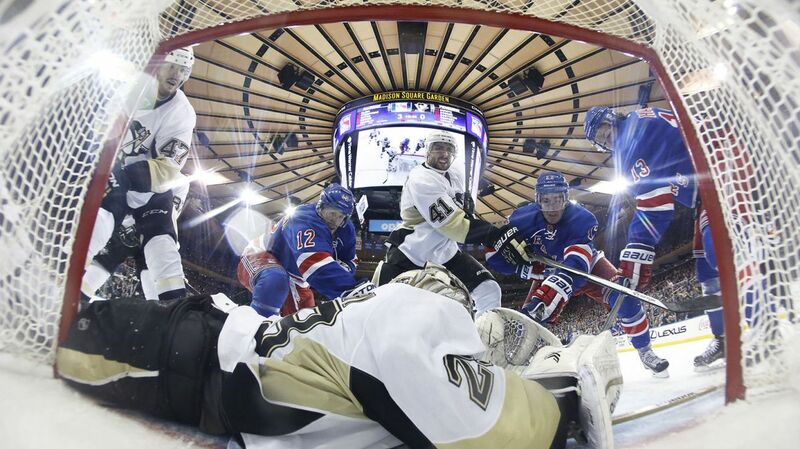 The Rangers had all the momentum, and a goal for the Penguins could have dampered all of that. Instead, the Penguins were denied and the Rangers still had their momentum. Tanner Glass did his best Matt Hunwick impression tonight, stopping the puck from going over the goal line, and keeping the game scoreless. Photo courtesy of MSG Photos. The first goal for the Rangers came from Mats Zuccarello, who scored so quickly that the cameras didn’t even catch it on MSG. After Derek Stepan won the faceoff, Zuccarello got to it immediately and fired a laser over the shoulder of Fleury for his third goal of the season. It was also Zuccarello’s 100th career point. Martin St. Louis scored shortly after that, making it four goals in the last five games for him. Marc Staal one-timed the puck from the blue line, but it was blocked by a Penguins’ defenseman and bounced to Rick Nash, who was right in front of the net. Rather than putting a quick shot on net, Nash had the presence of mind to make a slick pass to the wide open St. Louis on the other side of the net, and he put it past Fleury for his fifth of the year. Martin St. Louis scored his fifth goal of the season thanks to a heads-up pass from Rick Nash. It was St. Louis’ fourth goal in five games. Photo courtesy of MSG Photos. The Rangers kept the pressure on the Penguins, and managed to score their third goal of the period on a Kevin Klein slap shot that beaut Fleury. The goal started with Kevin Hayes keeping the puck in the zone on an attempted clear. Stempniak eventually gave the puck to Hayes, who dropped it back to Klein and he shot a one-timer that went past a few Penguin defenders and into the back of the net. It was Kevin Klein’s third goal of the season, and he is still the only defender to score a goal this season. Kevin Hayes had the primary assist, and he now has points in back-to-back games. The Rangers continued to win faceoffs and one-on-one battles with the Penguins, taking a 3-0 lead into the locker room after dominating the first 20 minutes. The second period was a similar story, as the Rangers continued to play aggressively and maintained puck possession for long periods of time. Fleury also continued to do his best to keep the Penguins in the game, robbing Stempniak on the power play and keeping the score at 3-0 for a while. The referees ruled that Marc-Andre Fleury was interfered with, and was unable to defend the goal, meaning Kevin Hayes’ goal did not count. The Rangers would answer back minutes later with a power play goal. Photo courtesy of MSG Photos. The Rangers didn’t let it get to them, and after Steve Downie took a roughing penalty on the previous play, the Blueshirts got their redemption and capitalized against the third-best penalty kill in the league. Derick Brassard took a fantastic shot that beat Fleury high on the glove side, putting it exactly where he wanted to. The assists went to Rick Nash and Dan Girardi. It also marked Brassard’s 13th point in as many games. The Penguins had their own chances, but “The King” managed to make some fantastic saves, most notably his saves on Nick Spaling and Chris Kunitz, and the Rangers took a 4-0 into the third period. Henrik Lundqvist was fantastic tonight, stopping all 33 shots he saw and earning his third shutout of the season, and his 53rd career shutout. Lundqvist improved to 7-4-1 on the year. Photo courtesy of MSG Photos. The Penguins came out very strong, registering the first six shots on goal that period. But the Rangers quickly stopped that, only allowing three shots after that. Rick Nash put the exclamation point on the game, scoring a shorthanded goal off of a beautiful feed from Derek Stepan, who demonstrated tremendous effort on this goal, winning the faceoff and hustling back to beat his man to the puck and get it to the uncovered Rick Nash. It was Rick Nash’s 12th goal of the season, giving him the most goals in the NHL, as well as his 17th point this season. The second assist marked Derek Stepan’s 200th career NHL point. It was also the first shorthanded goal of the season for the Rangers. Rick Nash continued his hot start to the season, scoring his 12th goal of the season as well as picking up two assists, giving him 17 points and the most goals in the NHL. Photo courtesy of MSG Photos. The Rangers did a great job coming back from an ugly weekend, putting up five goals against a team that had only allowed five goals in the five previous games before tonight. They shut down an extremely high-powered offense, beat one of the best penalty kills in the league, and scored quite a few goals against a hot goaltender. Tonight was one of the most complete efforts from the Rangers all season, and the first period may have been their best period yet. There are a lot of positives to take away from tonight’s game, and the Rangers need to start playing like this more consistently. The Rangers won faceoffs at key moments tonight, like in the offensive zone on Zuccarello’s goal. Winning timely faceoffs on key areas of the ice can attribute to a team’s success, like it did tonight. As Rick Nash said, the defense was fantastic tonight. There were no miscues on both sides of the puck, and every player did a great job covering everyone on the ice. Kevin Klein was the best defenseman in my eyes. Not only did he continue to score goals, something he is not necessarily known for, he was tremendous on the defensive side, registering four blocked shots. Klein, along with other defenseman, have done a great job stepping up in the absence of other defensemen. 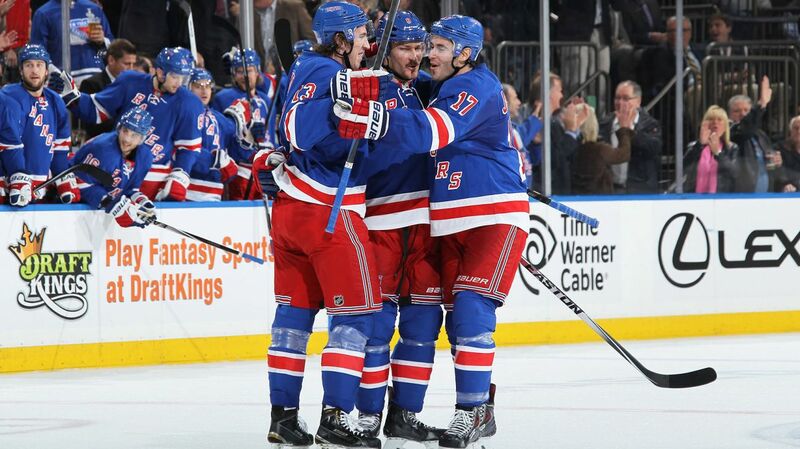 kevin Klein celebrating with Kevin Hayes and John Moore after scoring his third goal of the season. Klein was also great defensively, and has been one of the solidifying forces in an ailing Rangers’ defense throughout the year. Photo courtesy of MSG Photos. Rick Nash. What else is there to say about his season so far? Not only has he been producing on offense at an extremely high clip, he also plays very well off the puck. If you look at his highlight, you will see him cutting off passes and shots, covering forwards in front of the net, drawing penalties, and playing big in front of the net. Now that he is fully healed from his concussions, Nash looks like a different player this year, and continues his hot start to the season. 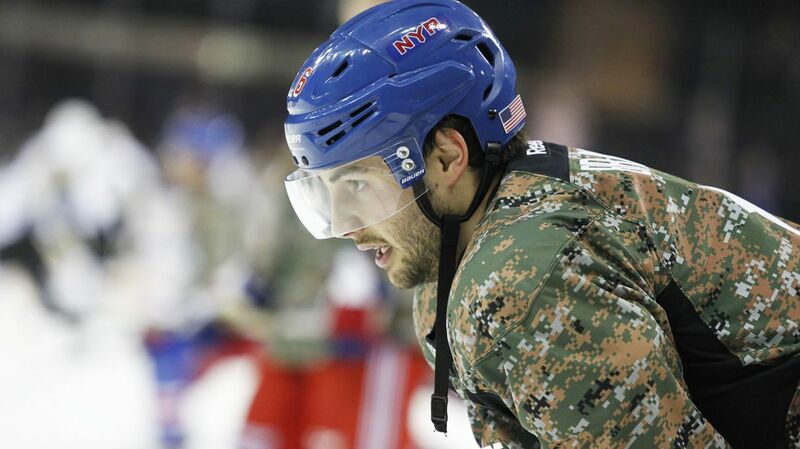 Derick Brassard is emerging as the potential long term number one center. Derek Stepan has done well since coming up, with three assists in three games, but Brassard has built up substantial chemistry with Rick Nash and Martin St. Louis. All three scored a goal in tonight’s game, and they also claim the top three spots for the Rangers in points this season. Derek Brassard has stepped up in the absence of key Rangers skaters like Derek Stapan, and scored his sixth goal of the season tonight. 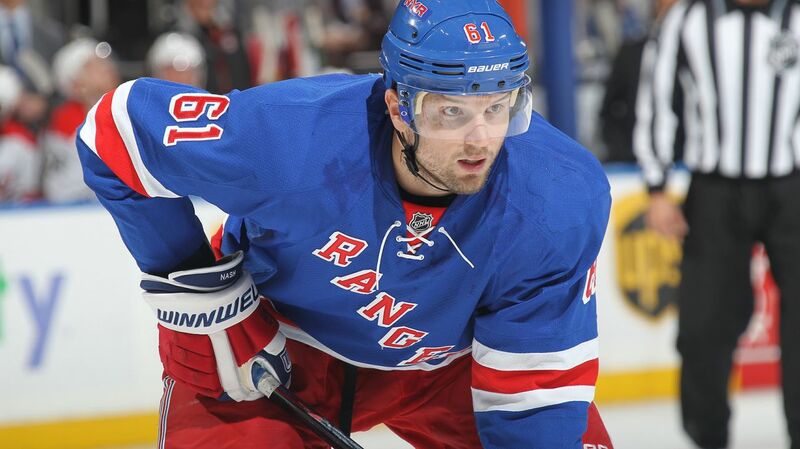 Brassard has also established a lot of chemistry with Rick Nash and Martin St. Louis on the top line for New York. Photo courtesy of MSG Photos. Brassard’s goal tonight was his sixth of the season, giving him 13 points in his last 13 games. 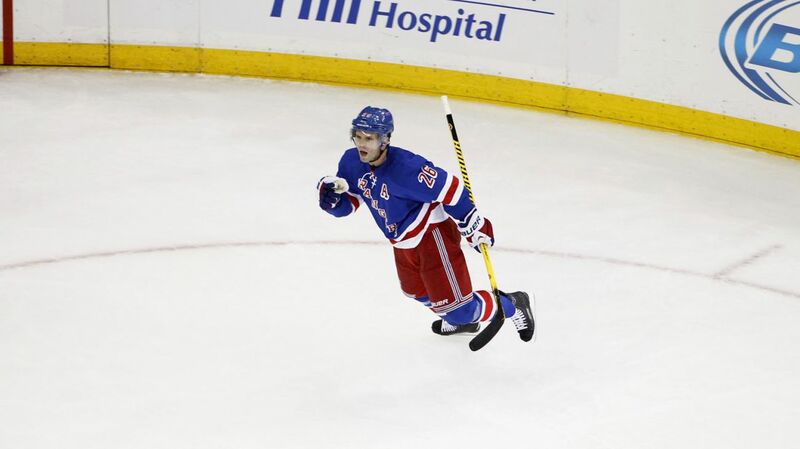 He has improved as a center in all aspects of his game, and is another Rangers skater that is streaking right now. The final piece of the top line, Martin St. Louis, scored yet again today, making it five for the year and four goals in his last five games. After struggling to score early in the year at the center role, St. Louis has thrived back at his natural right wing position, and continues to put up points for the Rangers. Henrik Lundqvist was sensational tonight, making a few highlight reel saves en route to his third shutout of the season. Lundqvist has turned in two back to back fantastic performances, and when he is on his A game, he is easily one of the best goalies in the league. 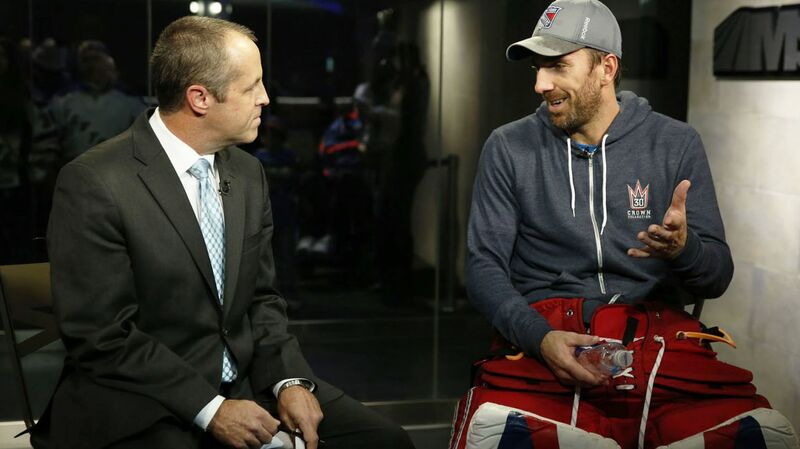 Henrik Lundqvist speaking with John Giannone of MSG following his 33 save shutout over the Pittsburgh Penguins, his third shutout of the season. Photo courtesy of MSG Photos. After the tremendous effort tonight, the Rangers will look to carry the good vibes from tonight’s game into Thursday’s match against the Avalanche (4-8-5) at the Garden, who have struggled to get things going early this season. Posted on November 12, 2014, in Game Recaps and tagged Alain Vigneault, Anthony Duclair, Carl Hagelin, Chris Kreider, Chris Mueller, Colorado Avalanche, Connor Allen, Dan Girardi, Derek Stepan, Derick Brassard, Detroit Red Wings, Dylan McIlrath, Evgeni Malkin, Henrik Lundqvist, Henrik Lundqvist shutout, Jesper Fast, John Moore, Kevin Hayes, Kevin Klein, King Henrik, Lundqvist shutout, Madison Square Garden, Marc Staal, Marc-Andre Fleury, Martin St. Louis, Mats Zuccarello, Matt Hunwick, Michael Kostka, MSG, New York Rangers, NHL, NHL 2014-2015 Season, NY Rangers, NYR, Pittsburgh Penguins, Rangers Nation, Rangerstown, Rick Nash, Ryan Malone, Ryan McDonagh, Sidney Crosby, Tanner Glass, The Duke, The Ranger Zone. Bookmark the permalink. Leave a comment.